Capstan and turret lathes are semiautomatic lathes. Semiautomatic means machining is done automatically but some other functions like changing of job/work piece and setting of tools are done manually. These are the modified version of engine lathe. It is an example of advancement of technology in manufacturing industry. Construction of turret/capstan lathes is similar to engine lathe but difference is they have an axially movable index able turret having hexagonal shape in place of tail stock on which multiple tools are fitted. These tools are capable in performing multiple tasks like turning, boring, thread cutting, drilling and facing. By using these tools we can easily perform different type of operations on a single work piece without changing of tool and work piece. All these tools are mounted on a hexagonal turret; turret is rotates after each operation. Turret lathe is used for mass production and the advantage of this lathe is a less skilled operator can perform work on it once all setup is done properly. These types of lathes can be used for machining large work piece also. These lathes are relatively costlier than engine lathe because of their complex construction. Using these lathes a single type of job can be easily repetitive manufacture with less effort and time or we can say that both the lathes are used for mass production. 1 In turret lathe the main turret is directly installed on the saddle and the saddle is move along the entire length of the lathe bed. Capstan lathe is ram type turret lathe and the movement of the ram is limited. 2 In turret lathe the turret tool head is directly mounted on the saddle and they appear like a single unit. Turret head is mounted on a slide called as ram which is mounted on the saddle in case of capstan lathes. 3 In turret lathe saddle is moved for providing feed to the tool. But in case of capstan lathe saddle is fixed at a point but ram is moved. 4 Saddle is move along the entire length so it is used to machining of large work pieces. The short strokes of the ram have some limitations so this lathe is used to machining of small work piece only. 5 It has slower operation because of heavy weight of all the components. It has fast working operations because lighter in construction. 6 In turret lathe limit dogs are used to control the movement of the tool. In case of capstan lathe feed stop screws are provided at the rear side of the turret for controlling the tool movement. 7 It is used to machine large work piece so large depth of cut and feed is provided for machining. Relatively less feed and depth of cut are provided for machining because used for small work pieces. 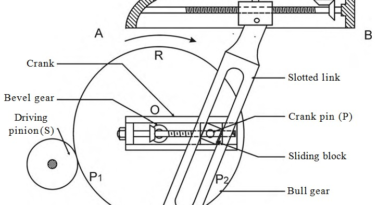 8 In turret lathes external threads are generally cut by a single point or a multipoint chasing tool which is installed on the front slide and moved by a short lead screw and a swing type half nut. But in case of capstan lathe external threads are cut using a self opening die which is mounted on the one face of the turret. 9 Turret lathe is mostly single spindle and horizontal type lathe but may be vertical and multi spindle type in some cases. But the capstan lathe is usually single spindle and horizontal axis type only. 10 In turret lathes power operated jaw chucks are used to hold the work piece. In case of capstan lathe hand operated collect chucks are used for holing the work piece. 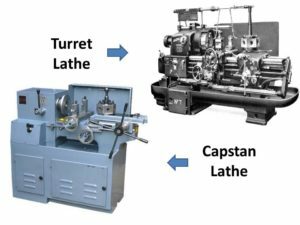 These are all major difference between capstan and turret lathe. If you have any query regarding this article, ask by commenting. If you like this article, don’t forget to share it on social networks. Subscribe our website for more informative articles. Thanks for reading it. 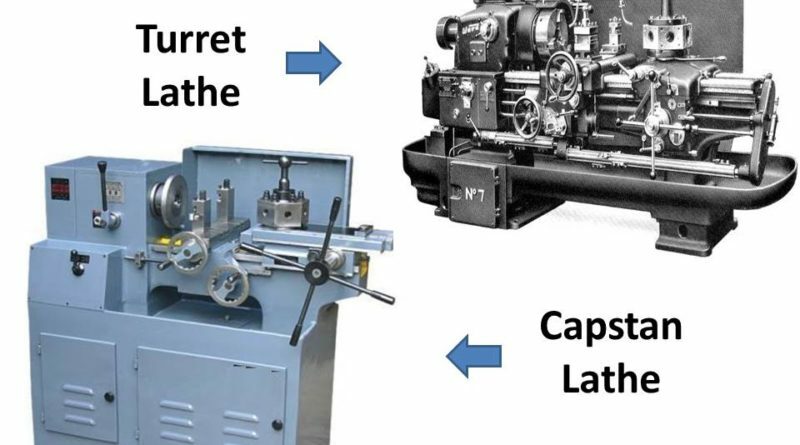 ← What are Main Types of Lathe Machine?